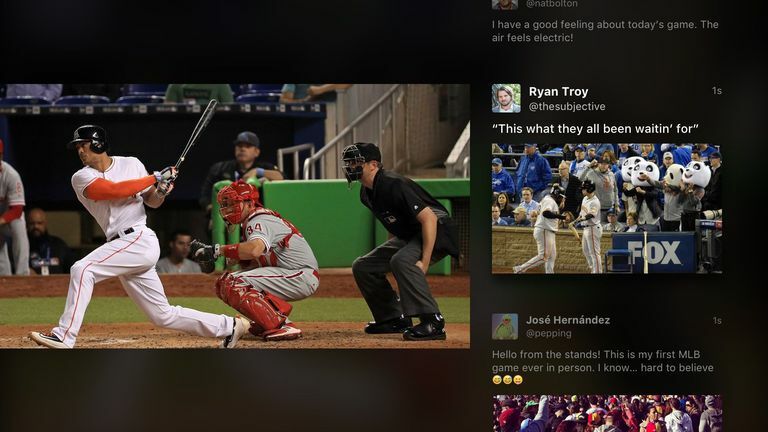 Twitter has embraced the Apple TV by providing a free app that lets you watch a rapidly growing collection of live events, including all the latest NFL action. Its transformation into a live events channel is made even more engaging because as well as showing you what happens, it also lets you read people’s live reaction to that action as it takes place, by offering a curated selection of Tweets from around the planet. Twitter’s plan to become a broadcaster was first noted by The New York Times, which first reported speculation about this. Now that it's available, Twitter's app has unleashed a new era of socially connected TV. "Twitter has always been a great complement to TV, and now fans can enjoy even more premium video,” said Twitter CFO, Anthony Noto. The company is reaching a host of different content deals. When it began it started to offer NFL’s Thursday Night Football games through the Apple TV app. This is great as it means you can access all the action without needing a pay TV subscription (or even a Twitter account). Twitter has reached signed similar deals with Wimbledon, the MLB, the NBA and the NHL, suggesting it hopes to become a leading international sports and sports reaction broadcaster across multiple digital platforms. Additional content comes from Pac 12 Networks, Campus Insiders, Cheddar and Bloomberg News. User-generated Periscope videos complete the mix. More recently the company broadcast the Presidential inauguration, and in future plans to provide a window at other celeb-studded live events, including the Billboard Music Awards and the American Music Awards. The company is also creating some original content in the form of exclusive interviews with celebrities attending these live events, and wants users to contribute some of the questions it asks, Variety claimed. Twitter is attempting to define itself space in the future of socially connected cord cutting on television. Its attempt means around 313 million monthly active Twitter users can look forward to much more from the service. The company extended the video limit for posts from its users to 140-seconds, up from the previous 30-second limit in June 2016. It is so easy to use Twitter’s Apple TV app -- you just launch it: there is no paywall and no need to log in. Crisp and clear, events are clear, detailed and a pleasure to watch. The provision of expert analysis and additional video feeds also adds to the experience. Though they are the main highlights, games aren’t the only things on offer through the app, you’ll also find curated selections of what’s happening today on Twitter along with the top Periscopes of the day, each situated in their own section. Select one of these and you’ll either see the action or be presented with a scrolling selection of some of the best Tweets. The Timeline integration takes a little getting used to when watching games. It occupies around one-third of the TV screen and provides a curated collection of people’s reactions during the game, which can be a little distracting but is kind of engaging. The on-screen Twitter integration is a little limited as you can’t ‘like’, publish or react to Tweets you see on screen during the game, though you can use mobile Twitter on your iPhone. The feeling of being connected to other people while watching important events is very alluring and the app should attract many new users to Twitter while being a lot of fun for Apple TV owners. This isn’t the only sports app you’ll find for Apple TV, far from it, but Twitter provides a unique twist that should benefit from the social nature of sports consumers, with a selection of additional content that should help make Apple TV a far more social tool. It would be great for the company to continue to improve the interface -- being able to search Tweets or even filter out some comments and categories would be valuable. The app is also available for Amazon Fire TV and Microsoft Xbox One and will also let you explore curated content from Periscope. With around 79 percent of Twitter’s users residing outside of the U.S., it is not at all surprising that the app is available internationally at the iOS App Store. What is an Apple TV and Should I Get One?